Archaeologists report that the foundation of the 250-year-old Jahan Nama Castle, described in texts of the era as a recreation site, has been found. 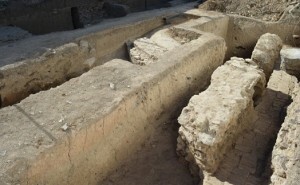 The head of the archaeology dig in Isfahan told ISNA that the remains of the Savafid-era building have been uncovered. The site was discovered during construction of a subway for the city of Isfahan. Jahan Nama Palace was built at the time of Shah Abbas of the Safavid and provided a panoramic view of the city at the time. However, Zel-ol-Soltan gave orders to destroy it, claiming the site provided a view of Hasht Behesht Palace, where his sister lived.